Previously, Buchanan was the co-host of CNBC's political talk show, Equal Time. 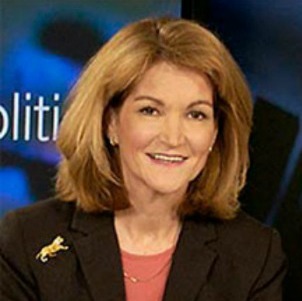 In addition, she has worked as a political analyst for Good Morning America, MSNBC, and has been the host of the national talk radio program, Live with Bay Buchanan. Buchanan began her political career as the national treasurer of Ronald Reagan's presidential campaigns in 1980 and 1984. This position catapulted her into a distinguished career beginning in 1981 when President Ronald Reagan appointed her to be Treasurer of the United States. At the age of 32, she was the youngest person to hold that position since it was established in 1775. Ronald Reagan called on her again in 1983 - this time to chair his Commission on Women Business Owners. Buchanan served as the campaign chairman for both of her brothers, Pat Buchanan, presidential campaigns in 1992 and 1996. During the 1996 presidential primary season, she emerged as a national figure steadfastly championing the right to life of the unborn child. As a result of her impact in the political arena, George Magazine recognized her as "one of the top 20 political women in the nation." For the 2008 election cycle, she served as chairman of Tom Tancredo's presidential campaign and as a senior advisor to Mitt Romney. She has chaired Reagan's Commission on Women Business Owners, and also co-chaired the California delegation to the Republican National Convention and the defense subcommittee of the Platform Committee. Along with Buchanan's many achievements, she is also president of The American Cause, an educational foundation founded by her brother, political commentator Pat Buchanan. Her first book, The Extreme Makeover of Hillary Rodham Clinton, was published in 2007. A native of Washington, DC, Buchanan has a masters degree in mathematics from McGill University in Montreal, Canada, and has further studies at several universities, including the University of New South Wales in Australia. In 1981, she received an Honorary Doctor of Law Degree from Samford University. Culture Wars—Can We Survive Them? "Bay Buchanan was a perfect match for our program. We appreciate the efforts she made to craft a speech for our group."